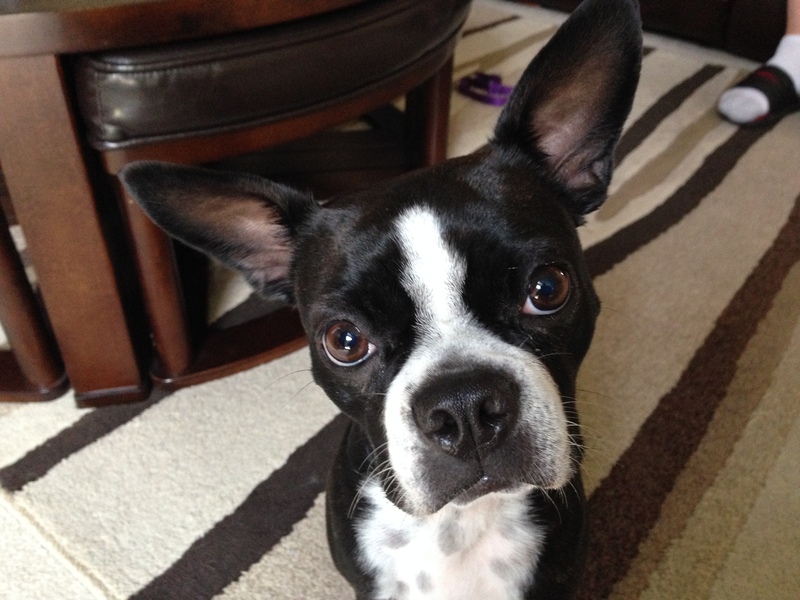 Lucy is a two-year-old Boston terrier who is timid and fearful of many things, especially the leash. Knowing that she was a timid dog I adopted a more relaxed and approachable stance when I arrived for the session. I disagreed and corrected her when she tried to jump up on me, but aside from that she showed a playful and curious energy. Once I got into the living room I started to see a little bit of twitchiness from her. She was countering the movements of anyone in the room anytime they moved. When a dog is doing this, it’s means they are in a hyper state of alert and are making certain that no matter where anyone moves, they have an escape route. This happens a lot with smaller breed dogs especially Terriers. Unfortunately many humans counter this by attempting to trap it by cornering it or snatching it. It’s perfectly normal for the humans to do this, but when you have a dog that is looking to avoid that exact situation, it can create a lot of problems, The most common of which is a damage to trust. I pulled out a leash to judge the dog’s reaction to the sight of it. I could instantly tell that Lucy had a negative opinion of the leash, she immediately darted away and locked her eyes on it. Her puples were dilated and her posture and movement indicated she was ready to bolt if a mosquito farted. I laid the leash down on the floor at my feet and then retrieved a high-value meat treat from my bag. These treats have no preservatives in them, a strong scent and are very soft so I rubbed them along the leash with enough force to trap little bits of the treats in the webbing of the leash. Lucy was clearly interested but remained cautious as she stared at the leash from across the room, so I tossed another treat a few inches away from it. That treat got Lucy up and over to investigate. 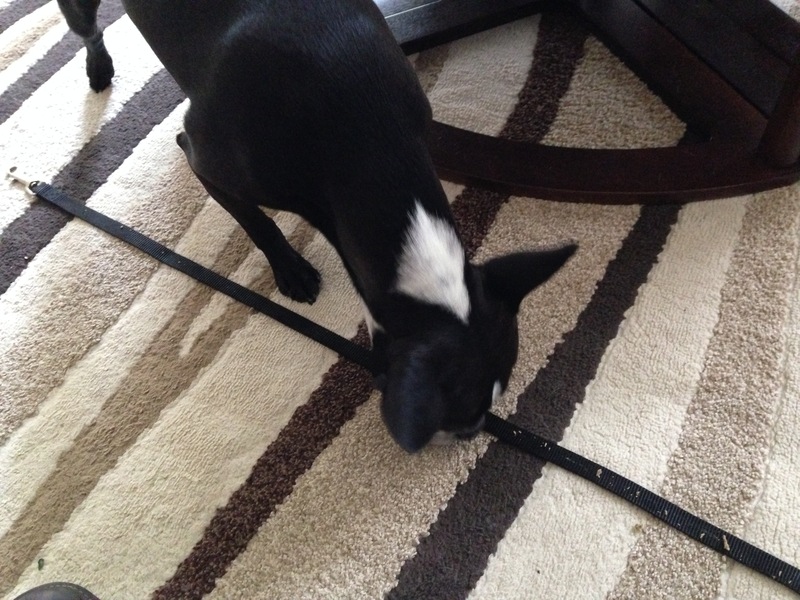 After she licked the treat up off the floor, her nose was only an inch or two away from the leash. I saw that she caught the scent of the treat remnants I had deposited on the leash. Lucy leaned over to lick them off the leash, at first leaning as far forward as she could to keep her feet on the ground as far away from the leash as possible. I made sure that I was completely still and didn’t react at all. As she licked up the pieces of treats she would gradually move forward. At first one small step, then another until eventually she walked all the way to the end of the leash licking up all the pieces I had rubbed onto the leash. I repeated this process three or four times while I discussed the dog’s history with Lucy’s guardians. I suggested that they repeat this exercise at least once a day for the next week or so. By rubbing the high-value treats on to the webbing of the leash constantly each day, we can help the dog associate a positive reaction to it. While there is no doubt that Lucy’s guardians love her to bits, there wasn’t as deep of a trust as there should be. And it wasn’t just with them. Lucy was wary of all humans. And because Lucy’s owners had occasionally picked her up in a bit of a snatching movement, it’s likely that this didn’t help with her trust of them. Lucy’s guardians had attempted to provide a lot of love and affection to counter the dog’s nervous or anxious state. But when a dog is in a unbalanced state; providing them with attention and affection can actually intensify their fears. Dogs associate the attention they are getting with the state of mind that they are in when you give it. I suggested that lucy’s guardians try to engage her in a game or activity the gets her literally moving forward. Dogs get over fears by moving in a forward motion. Usually a walk is my preferred solution to this issue, but due to Lucy’s fear of the leash, I decided to introduce a simple recall exercise instead. I had all the members of the family sit in a circle with treats in their hand. I showed everyone how to use a hand movement to make the treat more enticing to Lucy and get her to come over and sit politely in front of whoever called her. At first we had to do a considerable amount of coaxing to get Lucy to recall on command. But we stuck with it, and gradually Lucy started to recall faster and faster. After about a dozen repetitions you could see a little bit of a bounce in her step as she recalled. It was great seeing her trot over to someone and sit down in front of them, then look up at them while completely calm after being called. I advised her family to practice this exercise daily, then gave them instructions on how they could make it more challenging. This is an important part of her rehabilitation. 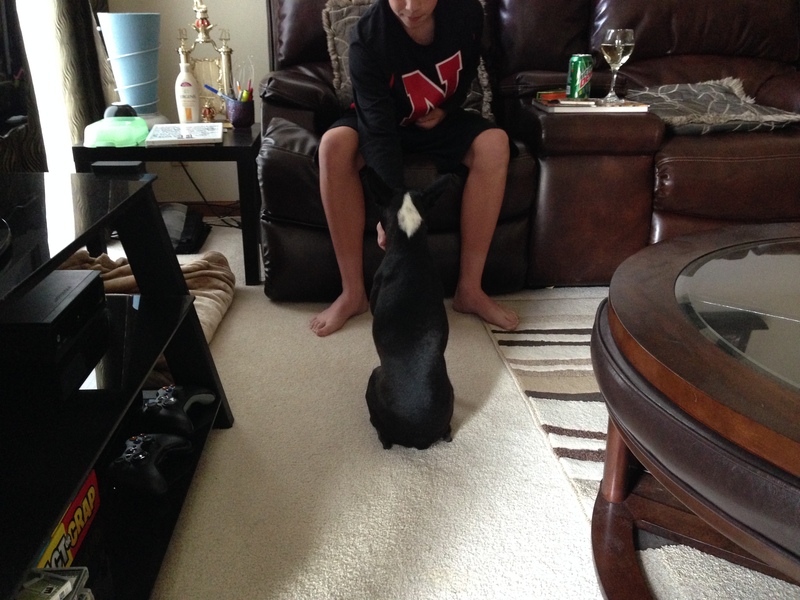 Every time they successfully recall Lucy and provide her with a high-value treat, they will be harnessing the power of positive reinforcement to teach their dog, increase her level of confidence and deepening her bond of trust and respect. One of the main things her guardians wanted from me was to help Lucy learn to enjoy going for walks. I picked up the leash and held it out towards Lucy while I remain seated. Lucy investigated a little bit but then moved away. I dropped the leash on the floor in front of her which was a few feet away from me. This added distance allowed Lucy to feel comfortable enough to come over and investigate the leash. I was hoping that the scent of the high-value meet treats we had used before would help lessen her trepidation. Because of her fear of the leash and collar and strong reaction, Lucy’s guardians had never gotten her used to wearing a collar. While no dog likes having a collar on at first, many dogs learn to associate it with positive actions such as going out for a walk. However once I placed the collar around Lucy’s neck her demeanor changed. It was subtle so I decided to press on but in retrospect that was clearly a mistake. Because Lucy had a fear of the leash and the collar, The next step should’ve been simply to place a collar around the dog and take her out into the backyard to play so she could get used to the collar on its own. But hindsight is always 20 / 20. At the time I thought the best course of action would be to continue moving forward because Lucy’s reaction to the collar wasn’t that intense. Lucy did have an intense reaction when I finally placed her on the leash. Many dogs learn that they can get their guardians to stop doing something by exhibiting certain behaviors. In Lucy’s case, she let out a terrifying sounding scream as soon as I added the slightest amount of tension to the leash. Because the amount of pressure applied was so minute I knew that this was a defense mechanism that had a foundation in fear. Clearly Lucy was using the sound to get me to stop which is a strategy she had previously used on her guardians. I dropped the lease to the floor then stood on it about a foot and a half away from the dog. Lucy went into a full blown temper tantrum, screaming, jumping, pulling and trying to get away. A lot of trainers used to grab a dog and pin it down in an alpha roll when it exhibited this type of behavior in the past. I find that technique extraordinarily invasive and counterproductive which is why I prefer to let the dog loose to a certain extent by keeping it on a leash. About 15 seconds later, Lucy sat down and stopped her protesting. Her body position was stiff and you could tell that she was uncomfortable, but she was moving her head around without snapping it to the sides. I attempted to motivate her to walk by applying a series of light pulls on the leash. However each time I did, she responded as she had done before with a scream like sound. I adjusted the leash so that I could support the dog’s front quarters off of the ground and then took her outside the house. I have had a great deal of success by picking up a dogs front quarters and continuing on a walk which engages the dog’s hindquarters. This is the technique I attempted to use with Lucy that proved to be ineffective. She shut down to such an extent that even though I could get her rear legs moving in a regular walk, as soon as I lowered her front paws to the ground she immediately stopped and curled up into a ball. After a few minutes it was clear that this technique was not going to work and in fact was probably creating a negative association, so I picked Lucy up and returned to her home. Once inside Lucy was still clearly unsettled, even after we removed the collar and leash. Fortunately her guardians happened to be babysitting a bulldog puppy for a relative and had the dog sequestered in a different room so as to not impact our session. In the hopes that the presence of another dog, especially a rambunctious puppy, would help return Lucy to a more balanced state of mind, I had them bring the puppy out. It took some time but eventually the puppy strategy worked. 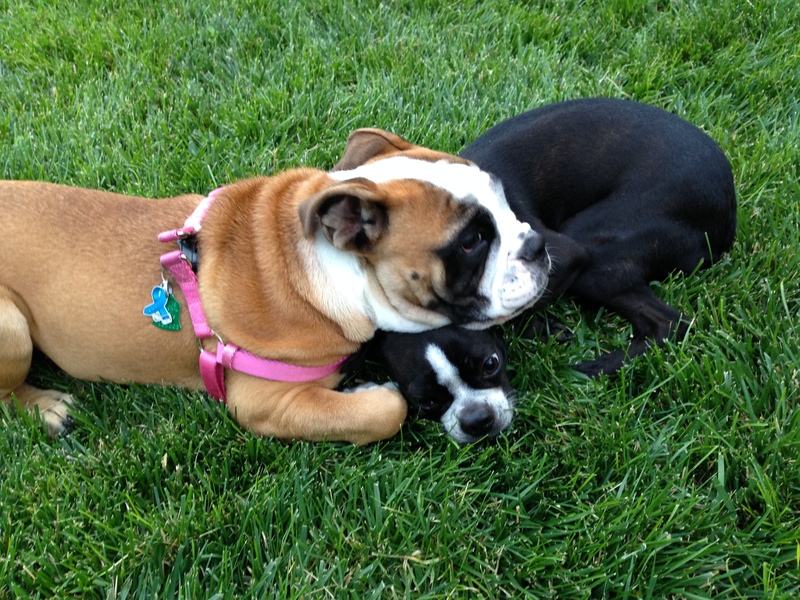 At first Lucy attempted to ignore the pup, but he was relentless. He took turns from running around her, licking her face, rolling over onto his back next to her and nudging her with his nose. At first Lucy simply looked away, but as they continued she started moving around while more aware of her surroundings. Her body posture relaxed and she elected to stay with her family rather than returning to the house, something they said she used to always do. By the time we ended the session Lucy was carrying her head relatively high, her ears were forward and she was moving on her own volition. That said, you could tell the session had taken it’s toll on her. She went back near one of her dog beds and curled up into a ball to catch some Z’s. I suggested to Lucy’s guardians that they get a collar for her gave them instructions on how they can place it on her in a relaxed and non-invasive way. I also advised them to repeat the leash treat rubbing exercise that I had done before, but do not attach the leash to the dog’s collar. The next goal is simply to get Lucy wearing the collar while maintaining a calm confident mindset. Because of her strong reaction to the leash, it will be important for her guardians to break things down into smaller more manageable steps. The first step is to get the dog used to wearing a collar. Once Lucy no longer fears or is anxious with the collar on, only then should her guardians move onto the next step.